Regarding SG8, if whenever a robot shoots a flag and the ball sometimes leaves the field, is it still a violation even though there is offensive intent? If every time a particular robot shoots a flag the ball tends to leave the field, then perhaps the question should be asked of whether or not it becomes a violation (probably it is up to the refs). If perhaps the robot is somehow built in some way that balls almost always leave the field, then this would lean towards a strategic design and be a potential issue. If under normal offensive play a normal robot shoots flags in a normal way and sometimes one leaves the field, then this clearly falls under the “expected that some Game Objects may unintentionally leave the field”. No, if a ball leaves the field while shooting a flag is not a violation. 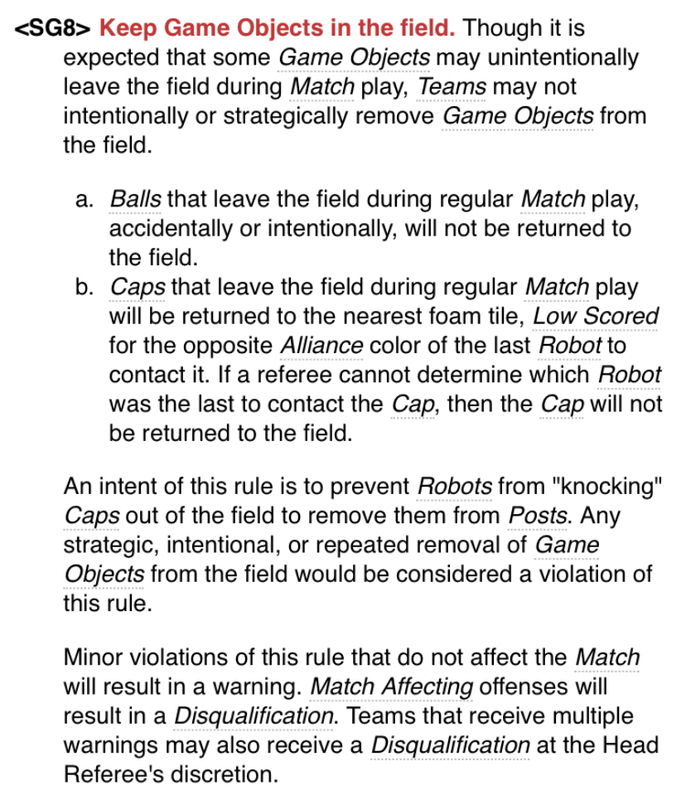 However, if your robot is designed in a way that it shoots balls out of the field when attempting to hit flags consistently, then even though unintentional, you could face a DQ as you have not taken care of a known flaw and that could be considered “intentionally” throwing the balls off of the field. Ok thanks for the quick response. Makes sense. Thanks for the response, my team has this issue right now so we will have to fix that.